A tool created to solve issues with running SCIV.EXE in Windows 7. Of course little 16-bit code will run on x64 (thanks AMD) so the entire 16-bit subsystem and the NTVDM has been removed from x64 Windows. Even on 32-bit Windows, the NTVDM has some severe compatibility issues. 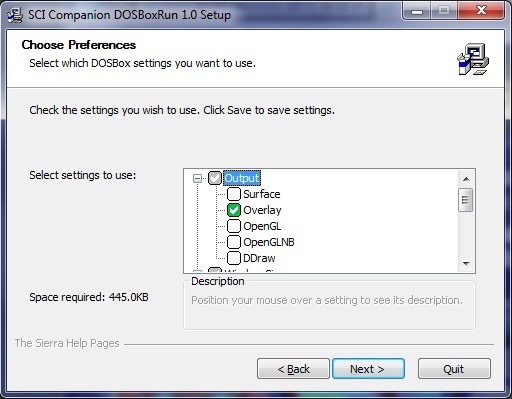 For our games, we have been using DOSBox to solve these issues, but both Companion and Studio run the game's executable directly, so to use DOSBox requires you to leave your environment to do so. It comes with an uninstaller to cleanup your game of the utility before distributing it, so be sure you have a backup of DOSBoxRunSetup.exe before running Cleanup "Cleanup DOSBoxRun.exe". Unzip into Companion's "Template" folder, overwriting the GAME.INI file. When you create a new game from within Companion, it will copy the setup into your new game's folder and keep the original in the Template folder. The first time that you hit the run button, the tool will run, allowing you select your DOSBox and settings, then launch the game. Every time you hit the run button thereafter, the game will start. If you want to change your DOSBox settings, run "Conf.exe" in your game's folder. When you are ready to distribute your game, run "Cleanup Game.exe" to remove the setup files.